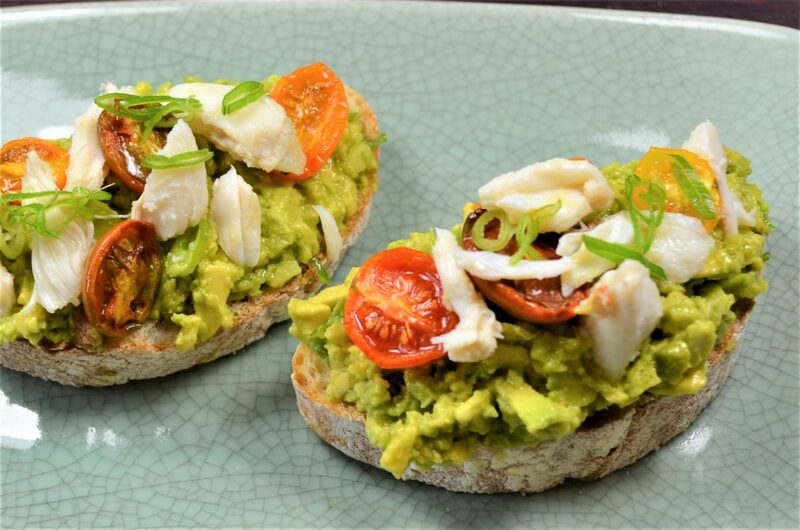 Avocado toast, just add crab! We have been doing this one for awhile, it is very simple, fresh and extremely delicious. Feel free to use any type of bread you want, rustic multi-grain works very well. Preheat the oven to 375⁰. In a bowl combine the tomatoes with 1 ½ tablespoons of EVOO, ½ teaspoon salt and ¼ teaspoon of pepper. Toss to coat and place cut side up on a sheet pan. Cook for about 20 minutes or until tomatoes are just soft and fragrant. Allow to cool. Combine 1 ½ tablespoons of EVOO with ½ teaspoon of salt and ¼ teaspoon of pepper. Brush the bread slices with the oil and place on a baking sheet. Bake for about 10 minutes until lightly golden and crisp. Allow to cool. Peel and lightly mash the avocado, add the lime juice and remaining salt and pepper and fold to combine. Spread the avocado mixture onto each of the crostini. Top evenly with the crab meat. Place a few of the roasted tomatoes on top and garnish with the sliced scallion.